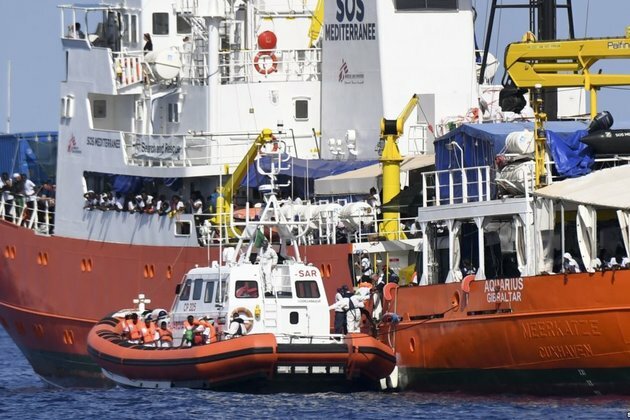 Doctors Without Borders (MSF) and the SOS-Mediterranee aid group say the migrant rescue ship they operate in the Mediterranean Sea is ceasing operations due to 'sustained attacks' from European Union states. MSF blamed Italy and other European states for smearing and obstructing the work of its chartered vessel Aquarius, which has helped rescue some 30,000 migrants in international waters between Libya, Italy, and Malta since February 2016. 'Not only has Europe failed to provide search and rescue capacity, it has also actively sabotaged others' attempts to save [the] lives' of migrants attempting to 'flee by sea along the world's deadliest migration route,' the Nobel Peace Prize-winning group said in a statement late on December 6. In June, the Aquarius became a symbol of the political and diplomatic crisis over migrants in Europe when Italy closed its ports to the ship and left it stranded with 630 people on board. 'This is the result of a sustained campaign, spearheaded by the Italian government and backed by other European states, to delegitimize, slander, and obstruct aid organizations providing assistant to vulnerable people,' MSF said. 'Coupled with the EU's ill-conceived external policies on migration, this campaign has undermined international law and humanitarian principles,' the group said. 'With no immediate solution to these attacks, MSF and SOS-Mediterranee have no choice but to end operations by the Aquarius,' it added. The Aquarius has remained in the French port of Marseille since October. In November, Italy ordered the seizure of the ship as part of an investigation into allegations that it had passed off tons of potentially toxic waste as ordinary waste at Italian ports.